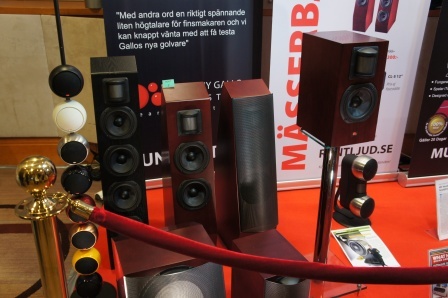 I thought I should share some photos and feedback on the HighEnd Mässan Stockholm 2012 Hifi show that took place at the Sheraton hotel in Stockholm 11-12th of February 2012. As always it’s hard to cover it all and I tried to focus mainly on the loudspeakers, still it was very hard to get enough time to seriously evaluate the different loudspeaker designs in this crowded show. 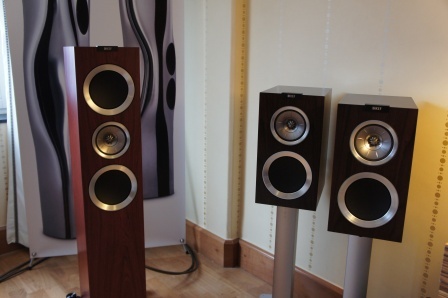 It’s very hard to do a fair sound judgment of the designs and equipment with the conditions offered at a Hifi show, but I think it at least gives a hint of the performance capabilities of the different designs. Some exhibitors complain about non optimal room conditions and sure some had to large or small rooms for their designs, but I think most of them did have conditions that isn’t much different from many peoples own listening rooms. Almost every exhibitor demoed with a computer as a source player. I’m a great fan of computer audio and I’ve used it for years, but sadly there where a lot of exhibitors that hadn’t a clue about how to get the best sound out of a computer. In my opinion, if done right, there is no better sounding and/or practical way to play music in your Hifi system. I was very happy to see that some new Swedish designers where represented in this year’s show and several of them had interesting and nice sounding designs. I’ve divided the show report into several parts. Unfortunately none of the loudspeakers where connected and I have no idea of how they sound. I think the design and finish looked very plastic and cheap. I wonder how these tweeter measures! Runt Ljud AB also displayed the upcoming room correction system from the Finnish company DSPeaker. 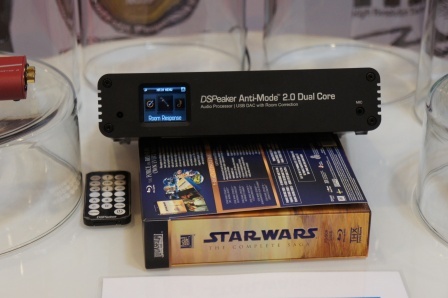 The Anti-Mode 2.0 Dual Core seems to be a very interesting product. In my current DEQXsystem I have the room correction features, but if I use any of my two other HiFi equipment systems, I don’t. This was a nice sounding setup from Focal and dcS. 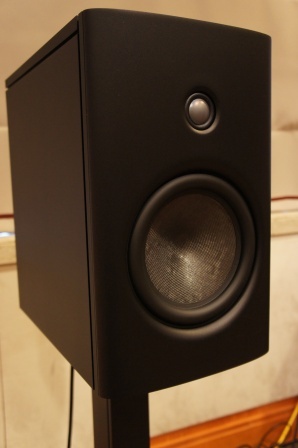 The Focal Diablo Utopia had a deep tight bass with a high resolution mid-range, but a bit edgy tweeter top-end. I’ve heard this setup sound better before and the reason could be the choice of source material. It’s always nice to see SEAS drivers in use. 🙂 In this case in the Finnish loudspeaker company Amphion. they sound to forward and bright for my taste. I only listened to the floor-stander. The waveguide technique is an interesting design choice that has a lot of potential, but I would prefer a less bright tuning option. 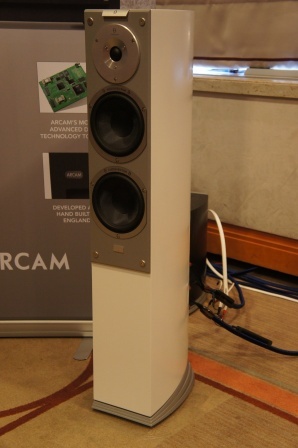 The Audiovector sounded okay using ARCAM equipment. It had a nice bass, but with a bit harsh top-end. I wonder how this tweeter measures considering the potential diffraction issues with the tweeters mounting placement! 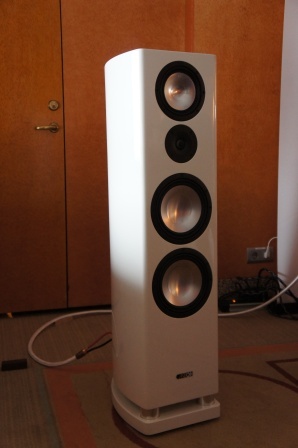 I cannot say that I was overwhelmed by the sound of the Magico Q3 floor-stander, but they played in a very large room and I only heard classical music on them. 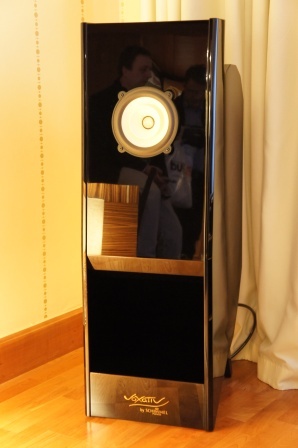 The new Magico Q1 stand-mount loudspeaker where only on display, but I would really like to have a chance to listen to them. 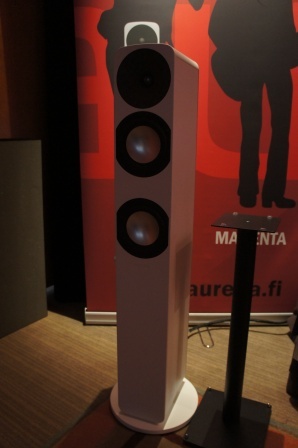 The Finnish loudspeaker company Aurelia Loudspeakers. 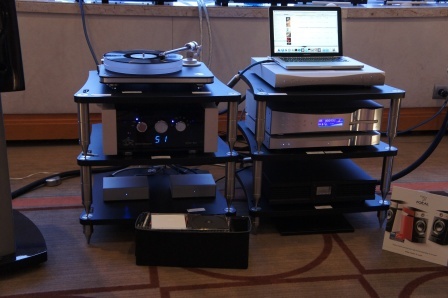 I’m sorry to say, but the Aurelia Ambera floor-stander sounded harsh, compressed and forward in this setup. I think it has potential to sound a lot better in a different setup and with other source material. 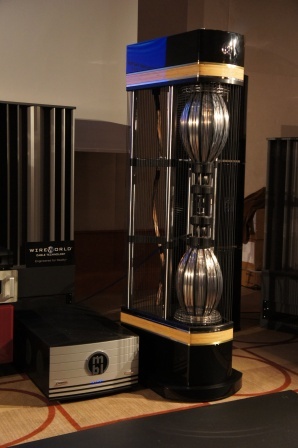 The German loudspeaker company Canton Loudspeakers. 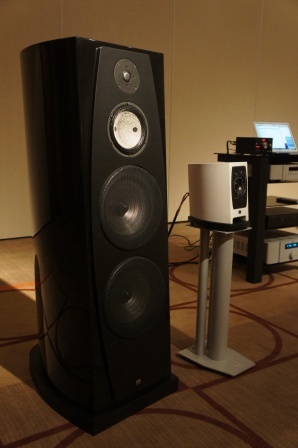 The new Canton Vento 890.2 DC floor-stander sounded quite good, unfortunately the stand-mount where only on display. 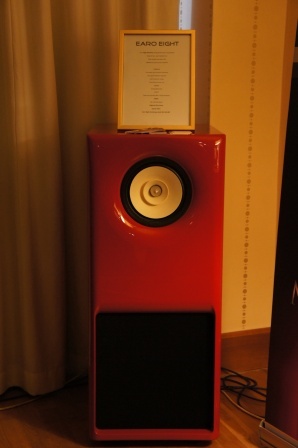 The Swedish loudspeaker company Marten Loudspeakers. Marten showed the new Marten Django 3-way floor-stander. 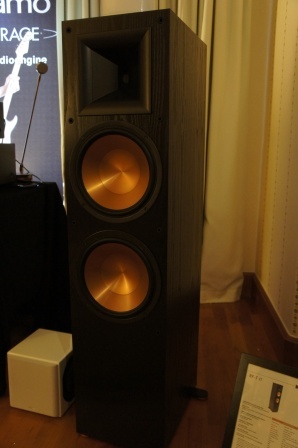 It sounded quite good, but with surprisingly light bass considering the three 8” woofers and its physical size. 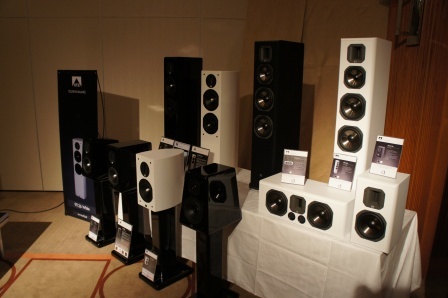 The Swedish loudspeaker company XTZ. 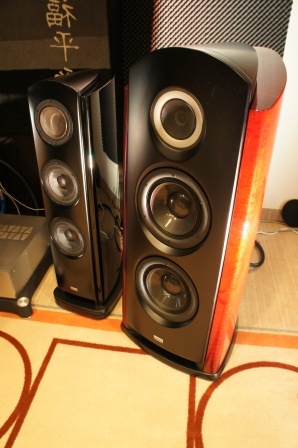 XTZ build both electronics and a broad series of loudspeakers models to very affordable prices. Down-left: The top of the line Divine 100.49 3-way floor-stander, using high quality driver units from SEAS, Accuton and Visaton. 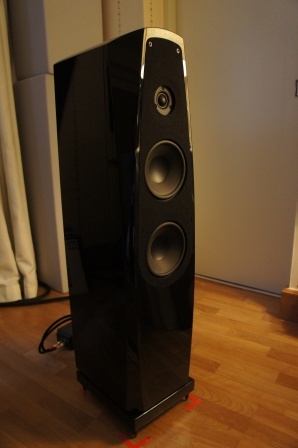 This loudspeaker sounds very good and is a true bargain for 6500$. 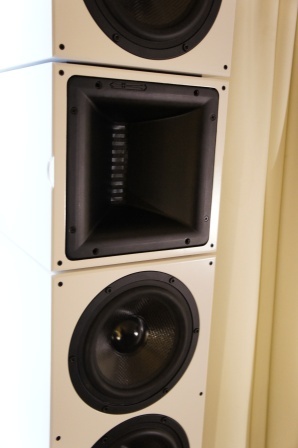 Down-right: the new loudspeaker series using what appears to be Fountek ribbon tweeters. The German loudspeaker company MBL. The Radialstrahler MBL 101 X-treme where used in a multi-channel setup and with the smaller MBL 101 E MKII being used as rear-channel. This setup was in my opinion the best sounding setup at the show. The experience was simply overwhelming. It was an unusual sound experience as it didn’t sound like a loudspeaker, it simply produced the most realistic sound stage I’ve ever heard. 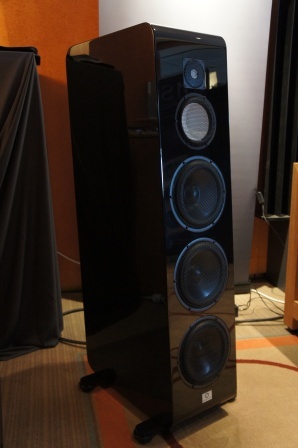 Note the enclosure stack in the back-ground which were used as sub-woofers. 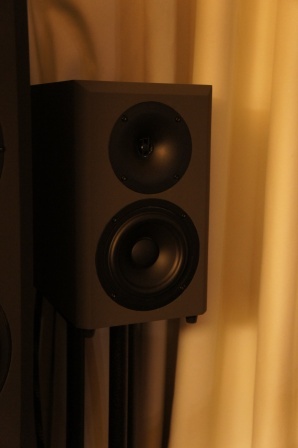 Left: The Klipsch RF-7 II. 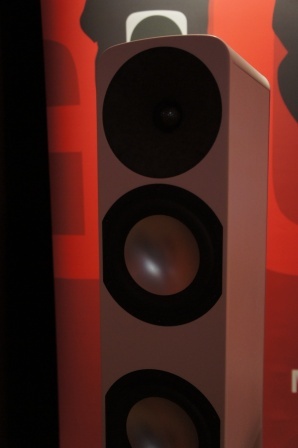 The nicest thing I can say about these loudspeakers is that they can play bass. 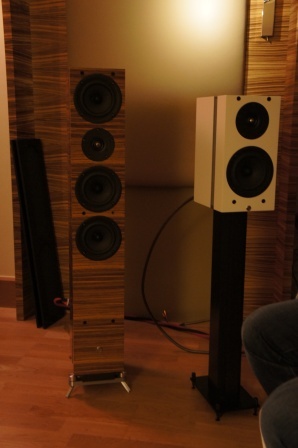 Right: The Harbeth loudspeakers sounded nice and very musical, but the design is boring and feels out-dated. 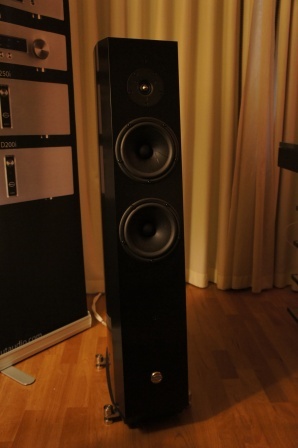 The new Swedish loudspeaker company Decisive Audio. 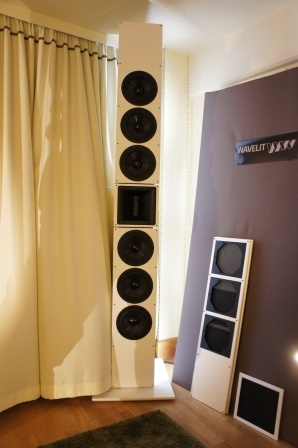 Decisive Audio demoed their Indra 41 2.5-way floor-stander and their Nala 11 stand-mount. 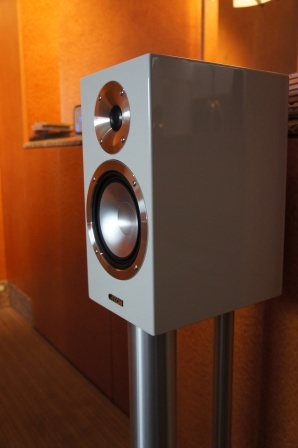 The Indra 41 uses four 8” alu woofers together with an 8” waveguide or considering its depth, more like a horn. 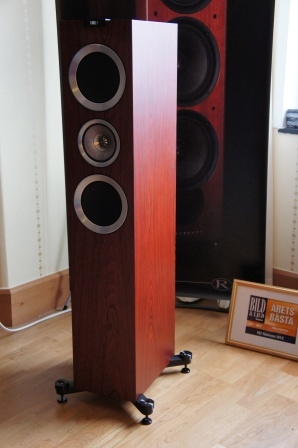 The woofers are tuned to a low 20Hz and the claimed 17-20000Hz doesn’t seem exaggerated. The cross-over at 2kHz is pretty high considering the size off the woofers, but according to the designer that’s intentional. The have constructed the loudspeaker with a controlled directivity in mind and they want the 2-4kHz frequency region to be to some degree reduced at the off-axis frequencies. Therefor the loudspeaker is meant to be toed-in towards the listener. 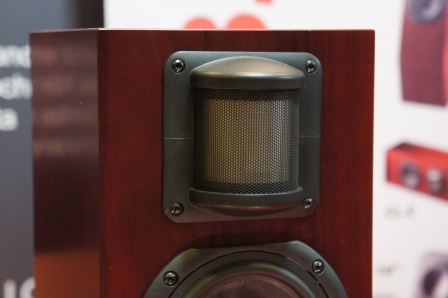 The Nala 11 uses a 5.25” mid-woofer together with a waveguide tweeter crossed-over at 4kHz. 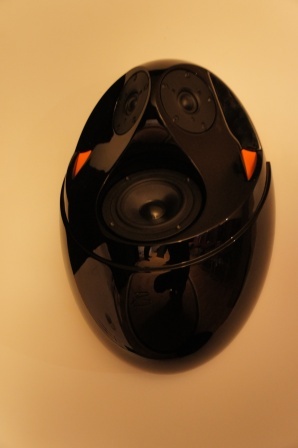 Again, the designer has built this loudspeaker with the same idea of controlled directivity. The Indra 41 can be played very loud without feeling stressed. 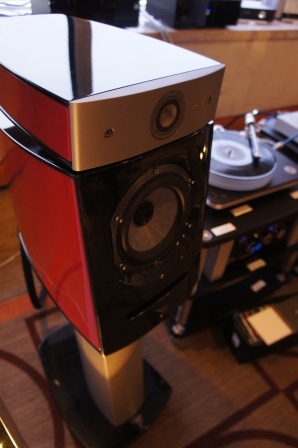 This is a perfect party loudspeaker while at the same time sounding very good with a clear HiFi ambition. In fact this was one of the best waveguide implementations at the show and that’s not bad considering the competition, e.g. Amphion. 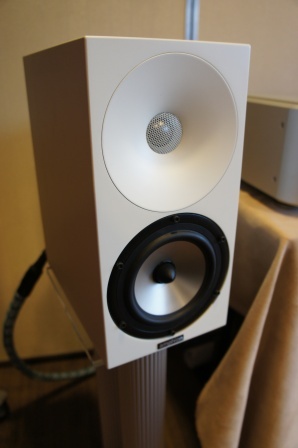 Both loudspeakers are hand build at customer order and are available in several finishes, like the Nextel painted in the pictures. 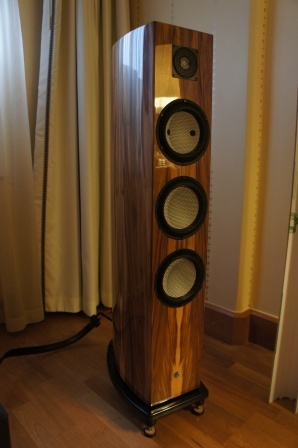 Nice job for a new loudspeaker company! 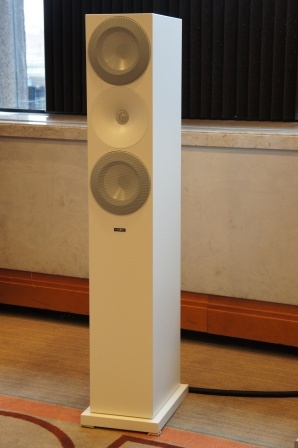 A quick listening session at the new KEF R500 3-way floor-stander gave a positive impression even though the distributor claimed that the loudspeakers shown where brand new and not burned-in. 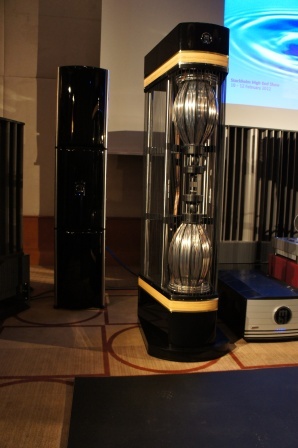 Here the latest generation of the “Uni-Q” co-axial driver derived from the “Blade Flagship” loudspeaker, is used. I’ve used a lot of SEAS co-axials in the past, but the KEF drivers is clearly leading the technology development for co-axials. A brief listening test wanted more! The GamuT M’inenT M5 sounded ok, but the Phi3 stand-mounts sounded surprisingly compressed, raw and with low resolution in this setup. I’m a big fan of ScanSpeak drivers, but considering the quality of the driver units used in both this loudspeaker series, I was a bit disappointed. It could be that the loudspeakers weren’t burned-in properly and perhaps not played with suitable electronics, but a gut feeling told me that something in the design wasn’t right here. A HiFi show isn’t the right place to judge a loudspeaker to hard and I will have to get a new listening test before ruling them out as a poor design. 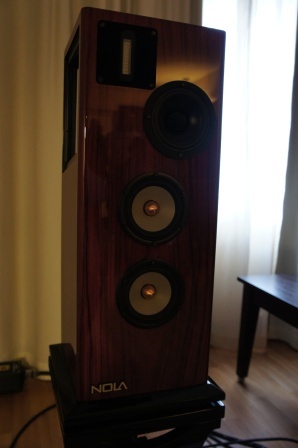 However, the loudspeakers had a very nice finish! 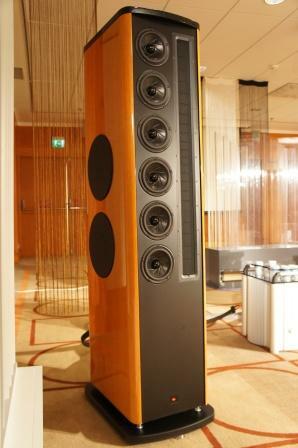 Yet another HighEnd loudspeaker using the expensive Accuton driver units. 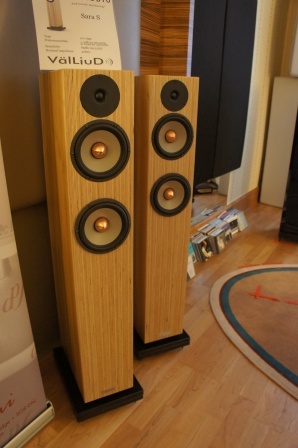 This time the German loudspeaker Artos Audio Sunrise 2.5-way floor-stander. 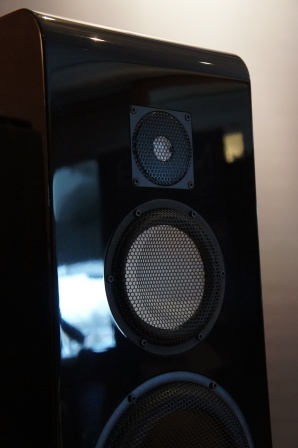 A quick look and listening test didn’t only reveale a great looking speaker, but also a nice sounding one. Someday I will build something around these Accuton drivers! 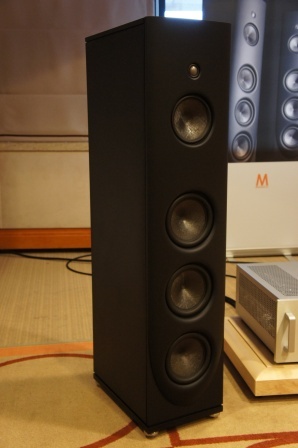 Yet another Swedish manufacturer of electronics and loudspeakers GDis. 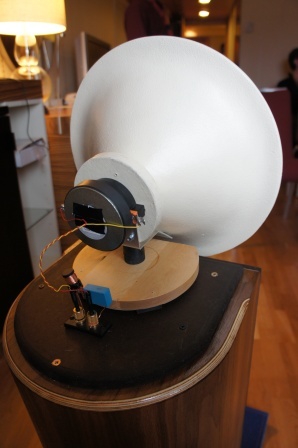 Here showing a loudspeaker prototype. Note the simple cross-over parts for the high frequency driver. I very much liked the GDis LSP-1 loudspeaker at the last years HighEnd show, but this new prototype wasn’t my kind of speaker. It was very forward and funnel sounding. The NOLA Micro Grand Reference Series II 3.5-way stand-mount loudspeaker using SEAS Excel woofers, Raven ribbon tweeter and to me an unknown midrange in an open-baffle design. I’ve used a similar SEAS woofer in my “Excellence Two – Mini Monitor” design and it’s an incredible sounding little woofer and can fill a room with surprisingly tight and powerful bass. The NOLA Micro Grand Reference Series II is no exception and it sound great from the bottom to the top. Left: Another Finnish manufacturer of loudspeakers PENAUDIO. 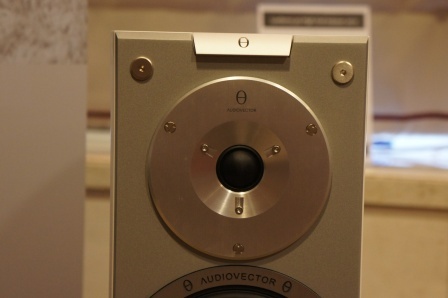 Unfortunately I didn’t have the chance to listen to this Sara S 2.5-way floor-stander. 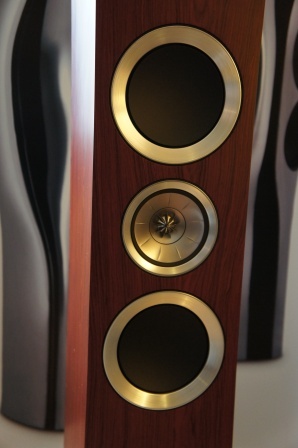 The SEAS Excel W16NX woofers are very interesting and I might in the future do a design with them. I’m very skeptical of the designers chosen cross-over frequency of 4500Hz. If it’s true the drivers cone break-up at around 5kHz, can’t be enough suppressed. Right: Rockport floor-stander. As I recall, these sounded good. 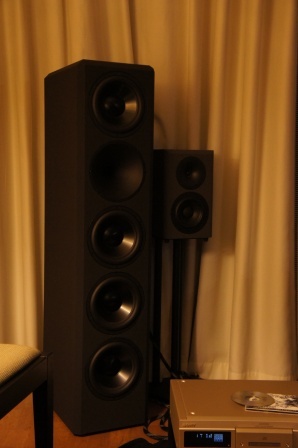 I’m not a big fan of “full-range” horn loudspeakers, but these two actually sounded quite good for its genre. 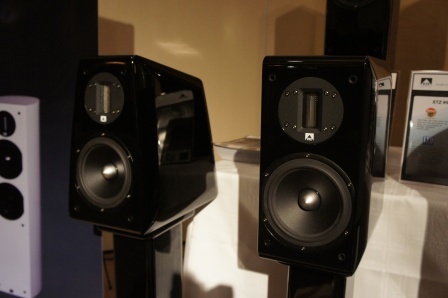 Left: The EARO EIGHT is an active DSP powered loudspeaker. Right: The VOXATIV Ampeggio is a back-loaded horn powered with a Voxativ neodymium full-range driver (AC-3X). Both loudspeakers are in my opinion ridiculously priced. 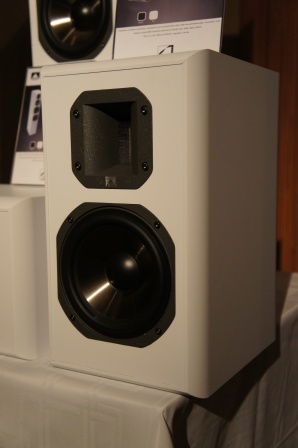 Left: The Bremen HD3D-12 here shown without front-grill is another great sounding Swedish loudspeaker constructed by the legendary HiFi Guru Peter Steindel. 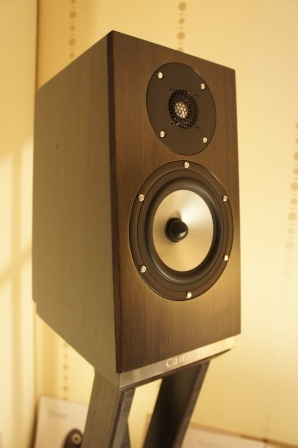 Right: Always nice to see a well-built loudspeaker using SEAS drivers. 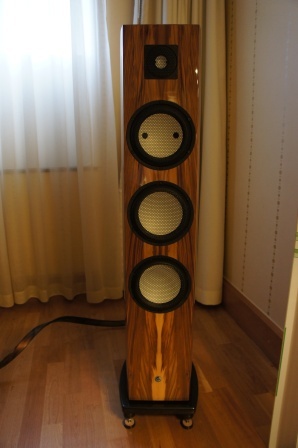 Another interesting Swedish loudspeaker concept, the Wavelit Direkt. 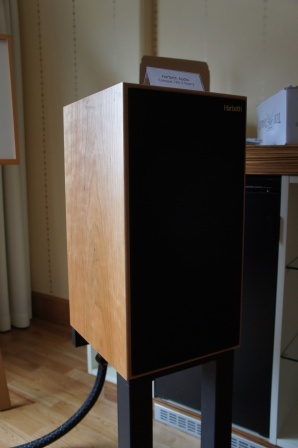 The Wavelit Direkt is an active loudspeaker with a cross-over at 1100Hz and is using the Dirac Live room correction. 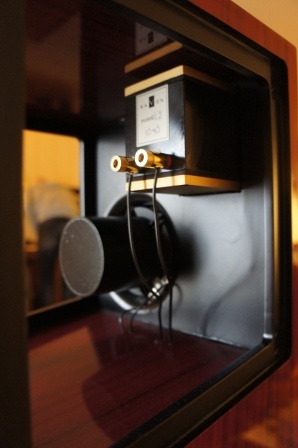 The tweeter horn seems to be the expensive Beyma TPL-150H. Left: The T+A SOLITAIRE CWT 2000 large floor-stander. It looked very impressive, but unfortunately in my opinion didn’t sound equally impressive. 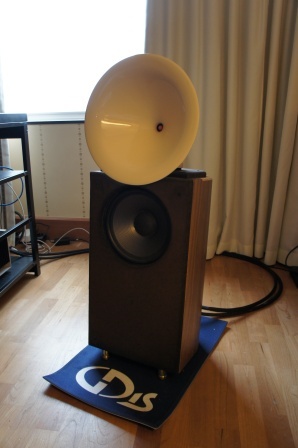 Right: The TAD loudspeakers sounded fantastic. The new smaller 3-way floor-stander Evolution One was almost as good as the Reference One. I’ve only covered a fraction of the show here, but the quality of the show was high and offered many new interesting designs and concepts and I was glad to see so many Swedish high quality designs.